Open Arts Foundation is pleased to invite you to the premiere presentation of the new bilingual website for Bulgarian contemporary art www.openartfiles.bg, part of the project “Open Art Files: Topics, People, Spaces, Files in Bulgarian Contemporary Art” that seeks to popularize Bulgarian contemporary art in Bulgaria and abroad. This is a new project of Open Arts Foundation, part of its long-standing educational platform “Introduction to Contemporary Art”, it is supported by Plovdiv 2019 Foundation and is part of the official program of Plovdiv – European Capital of Culture 2019. The site openartfiles.bg presents a database and archive of contemporary Bulgarian art, an online library and specially created thematic critical texts. 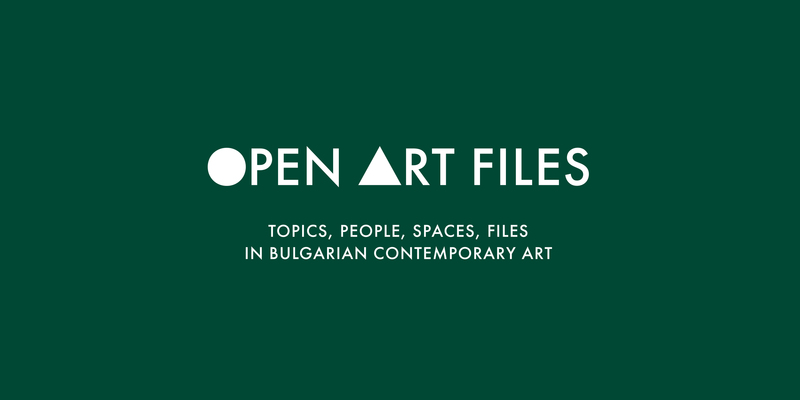 Openartfiles.bg is bilingual and will be updated and supplemented to create a more thorough picture of the processes, main topics, artists and events in the contemporary Bulgarian art scene. The content is built into four main panels: Topics, People, Spaces and Files, presented in a clear and accessible way. The Topics panel features specially created for Open Art Files authors‘ texts by critics, curators, art historians and artists serivng to navigate the readers. In the People panel can be found individual profiles of artists, curators, gallerists, art historians and critics, and in Spaces – information about state institutions, non-profit creative organizations, private galleries, donor organizations, informal unions – all included on the basis of the content of thematic articles. The Files panel is an online library (articles, exhibition brochures, catalogues, video archives and other links and archives, some of which have never been available online) generated by the other three panels. Currently, on the site can be found over 100 profiles in the People panel, 23 spaces, 15 key articles, and a library of more than 1400 resources and in 2019 the site content will continue to increase. This year, within the project “Open Art Files: Topics, People, Spaces, Files in Bulgarian Contemporary Art” will be held an exhibition promoting the openartfiles.bg website, an educational panel and a program of working visits and lectures by international art professionals, which will be realized in Plovdiv. The presentation is realised in partnership with Sofia City Art Gallery. “Open Art Files: Topics, People, Spaces, Files in Bulgarian Contemporary Art” is a project of Open Arts Foundation and is part of the official program of Plovdiv – European Capital of Culture 2019, supported by Gaudenz B. Ruf Award.